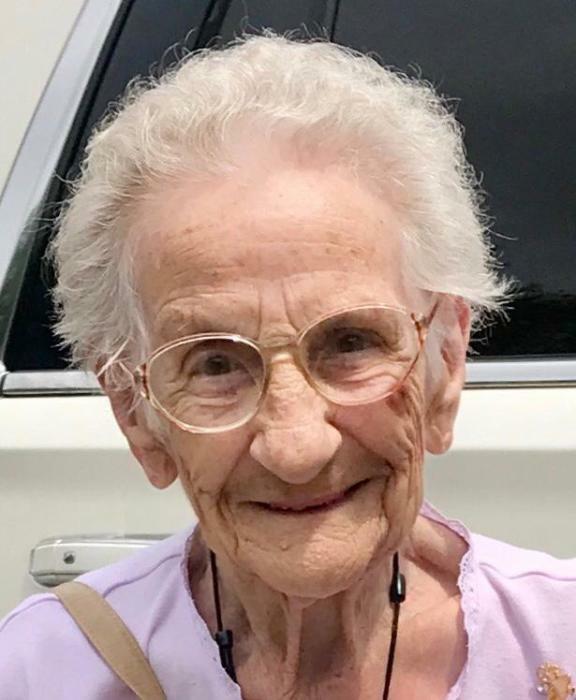 SOUTHBRIDGE – Friday, March 22, Clara Frances (Vacher) Nichols of Dudley, passed away surrounded by her family after a brief illness. She was born in Springfield, MA in 1922 and was the daughter of the late John Vacher and Ora (Baron) Vacher. She is predeceased by her husband Christian Nichols, Sr., and her four children: Lena Ryan formerly of Southbridge, Mary Anne Puduski, (survived by her husband David Puduski of Rock Hill, SC. ), Christian Nichols, Jr., and Frances Nichols both formerly of Dudley. She is survived by her sister Eva (Vacher) Hamilton of Holyoke, and predeceased by her sister Lorraine (Vacher) Nettekoven formerly of Appleton, WI, and her brother John Vacher formerly of Fort Mill, SC. She is also predeceased by her great granddaughter Jaime Lee Sheran of Sturbridge. She has thirteen grandchildren. Lena’s children: Karen (Ryan) Olson and her husband Robert of Brimfield, predeceased by James Ryan formerly of Southbridge, Kelly (Ryan) Ferron and her husband Dale of Southbridge, Kristen Ryan of Daytona Beach, FL, and Kerrie Ryan of Worcester. Mary Anne’s children: Brenda (Puduski) Edwards and her husband Mike of Warren, Pati (Puduski) Hale and her husband Bill of Oxford, Di (Puduski) Wrona and her husband Mike of Holland, Lee Puduski and companion Robert Labonte of Fort Mill, SC, Mary Puduski of Warren, and David Puduski, Jr., and companion Dawn Bromstrup of Mooresville, IN. Frances’ children: Louis Perrin and his wife Maria of Dudley, and Robert Perrin and his wife Quennie of New Market, AL. She also has 24 great grandchildren and 10 great-great grandchildren. Clara worked for many years at the American Optical in Southbridge, before retiring from there in the early 1980’s. She enjoyed watching the Red Sox, crosswords, word search books, and spending time with her family and friends. Thank you to the staff at Southbridge Rehab & Healthcare Center. And a special thank you to her friends at the Joshua Place in Dudley where she resided until recently. Calling hours will be Tuesday, March 26, 2019 from 5:00PM – 7:00PM at Sansoucy Funeral Home, 40 Marcy Street, Southbridge, MA. The funeral Mass will be held Wednesday, March 27th at 10:00AM at Notre Dame Church, 446 Main Street, Southbridge, MA. Burial will follow at New Notre Dame Cemetery, 746 N. Woodstock Road, Southbridge, MA 01550. If you would like to make a donation in her name please do so to either: The American Cancer Society, 30 Speen Street, Framingham, MA 01701, or Cystic Fibrosis Dept., UMASS Memorial Hospital, 55 Lake Ave North, Worcester, MA 01655.